Oh what fun! NSVH is turning one! We’ve had a wonderful year, and welcomed many clients and cute pets to the NSVH family. As a thank you for all of the love and support, we are sharing the birthday fun with a week of contests and giveaways! The week of November 13th NSVH is planning five days of contests with five amazing prizes. To participate, make sure you like our Facebook page and follow us on Instagram, as the contests will be held on our social media. Contest winners will have an opportunity to take home prizes such a FitBit Charge, a free microchip for your pet, gift certificates to NSVH and Pet Valu and many other goodies! Make sure to like us: www.facebook.com/newtownsquarevet.com and follow us: www.instagram.com/newtownsqvet to win! This celebration is our way of saying “thank you”, NSVH-style! We are so glad to have welcomed you to our NSVH family, and appreciate that many of you are ambassadors for helping our business grow. Year one has been the best adventure, and we can’t wait to see what year two brings. And Don’t Forget – Sharing is Caring! 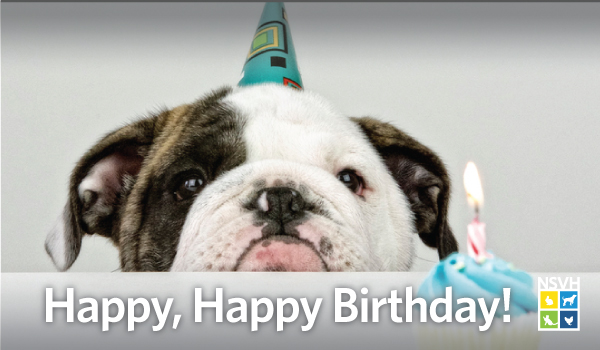 Spread the word about our birthday celebration to your friends, family and neighbors!